Today I thought I’d give you a break from me and bring you some inspiration from Pinterest. One of the items that I bought this year is the military jacket. You might remember from this post or this post. If you have one and would like some ideas, here’s what my research produced. I am really digging olive and orange. 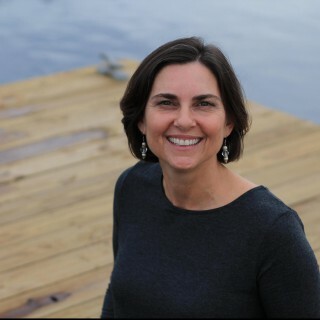 As a Florida Gator, you would think that I had more orange in my wardrobe but alas…I do NOT! I will be on the lookout for more orange. I love this orange dress but even an orange sweater or long sleeved tee would look good I think! 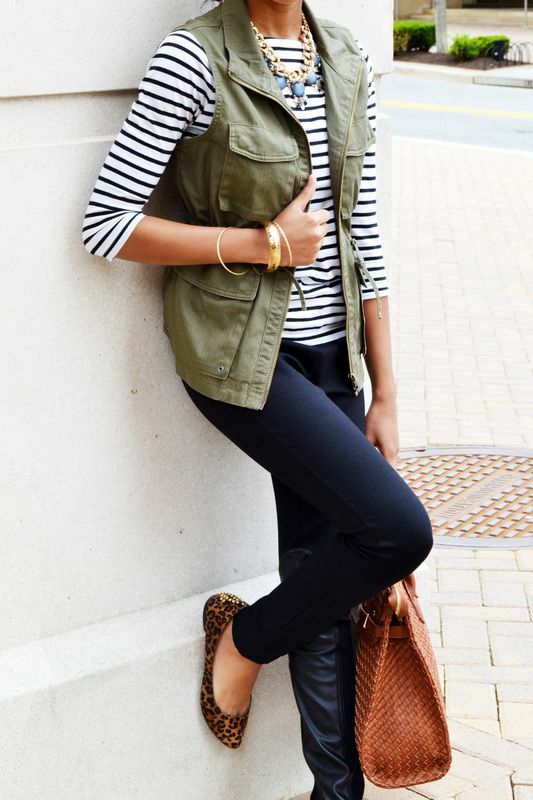 Pinterest is full of striped tops with the military jacket. I like that this one shows some pattern mixing with the leopard flats. I have worn an outfit similar to this! The size of the stripe changes the whole look, doesn’t it? THIS is why you can’t have too many striped shirts! I like the bold gold watch and long gold necklace with this outfit. 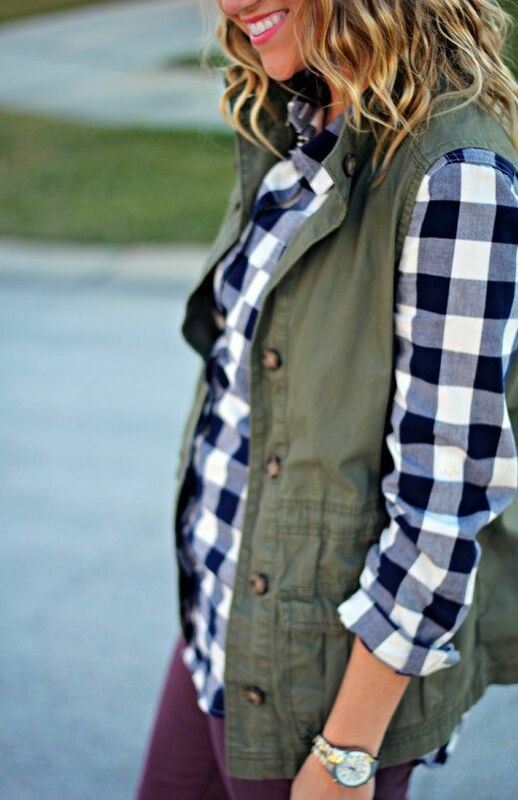 Wine is on trend this fall and I like the way it looks with the black checks and olive vest. Simple and yet fun! Which is your favorite look? I think mine is the orange. Do you have a military vest? How do you like to wear yours? This is such a fun idea! 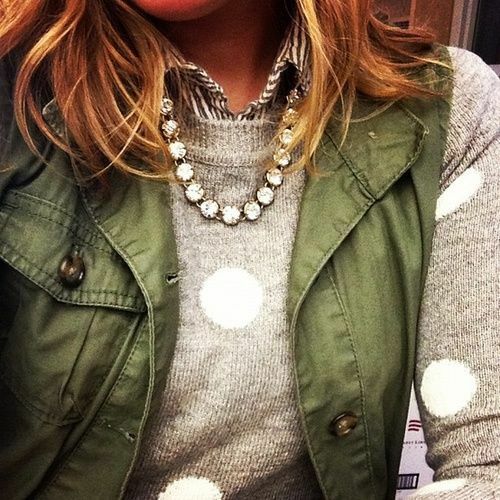 I love my military vest, and you showed some great ways to wear it here! I don’t have a military vest, but I do have a new orange scarf that I’ve been trying to work in somewhere. I am getting SO many ideas from this series. It helps me know what to look for at thrift stores. After seeing this I really want a military vest! Although I don’t know if my short height can really get away with it. Love my military jacket though! You picked out great looks! I’m still searching for a military jacket. I’m afraid the trend will disappear before I find one! 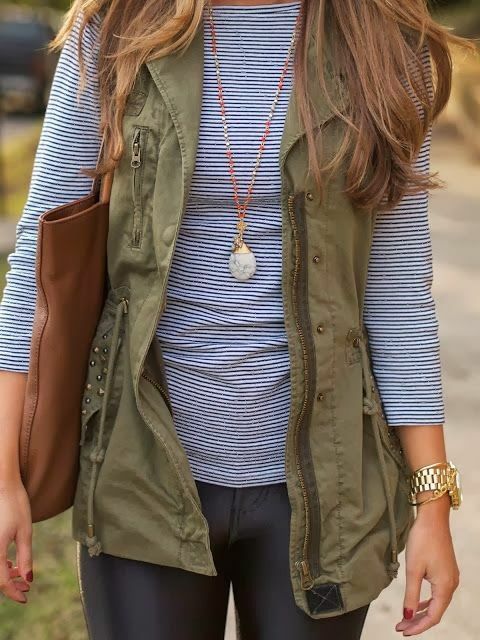 I just love the look with the striped shirt. Love all of these looks and think I have most of them pinned. How clever to use the military jacket with that great orange dress. Gorgeous.